Kinder Morgan Energy Partners (KMP) does not look wildly out of place compared to its peers when looking at total dollar amounts of maintenance capex (although keep in mind that the varying total asset bases are different, different sizes, different kinds of assets, different ages and thus require different amounts of maintenance). Yes, I think the argument could be made that perhaps MLPs as a group are inclined to be aggressive with their estimates of Maintenance Capex, since that will increase the Non-GAAP numbers for Distributable Cash Flow. It does also make sense that perhaps KMP could use a higher number for its Maintenance Capex related to its CO2 flood oil production; however, there can also be items that would be viewed as “maintenance” or “sustaining” expenditures that are showing up in the financials as operating expenses. Unfortunately there is never enough detail provided in public filings to be certain and the only way to be sure is to obtain the full reservoir engineering files and reports from a Company to go through with a Reservoir Engineer to check classifications, etc. Kinder Morgan is so large that they are probably not required to provide that level of info to anyone outside the Company. I have seen internal company reservoir engineering reports in my prior work life but usually for smaller upstream companies with Senior Secured Credit Facilities (i.e. not investment grade names like KMP). As a quick aside, that level of reservoir engineering info is probably still provided by LINE to it’s Credit Facility Lenders every six months. As of June 30, 2013, we have forecasted $348 million for sustaining capital expenditures for the full year 2013. This forecasted amount includes expenditures associated with the assets we acquired from KMI effective March 1, 2013 (the March 2013 drop-down asset group), and also includes $4 million for our proportionate share of our unconsolidated joint ventures’ sustaining capital expenditures. KMP appears to be using an estimate of $348 million for 2013, which is roughly $128 million higher or 58% higher than Hedgeye’s $220 million estimate. I have not seen the full Hedgeye report so I may be trying to compare apples and oranges (if so I apologize for my confusion in advance) and maybe the $220 million amount mentioned in the tweet does not cover all of KMP’s segments? However, the $348 million is a better amount than $220 million, even if $348 million may still be understated at least it is substantially higher. Addendum: Thanks to rlp2451 posting the info about Investor Village in the comments below, I have read the Hedgeye report. I am incorrect in my interpretation of Daryl Jones’ earlier Tweet about the $220 million of maintenance capex. The $220 million amount is for the natural gas pipeline subset of KMP’s assets and Hedgeye states the full 2013 estimate at $339 million (so in line with the number from the 10-Q). Apologies for my incorrect reading of the meaning of that Tweet, always tough with only 140 characters. Also I want to commend Kevin Kaiser for the massive amount of effort he put into digging up the data and analysis he used to put together that report. He even dug up FERC filings, I am very impressed. I am not sure how his comp structure works at Hedgeye but I hope he gets a good bonus or raise because he did a substantial amount of work and is generating a large amount of buzz for Hedgeye. The crux of his point on the maintenance capex is that KMP has been aggressively minimizing its maintenance capex and maintenance expenses (I agree that this can potentially reduce pipeline integrity and safety and I hate it when pipelines leak, explode etc.) and then doing things like replacing a piece of pipeline with a larger capacity pipeline and considering 100% of that capex as growth capex (even though some of it replaced capacity that went away so could partially be viewed as maintenance). His theory is that this approach is potentially being done purposely to benefit KMI by increasing the KMP LP units outstanding, increasing total distributions made, and increasing the amount paid to KMI via the Incentive Distribution Rights (“IDRs”), less GP givebacks in some cases. This concern is a classic MLP GP versus LP conflict of interest risk (a risk pointed out in every MLP IPO Prospectus, that long document that I think many individual investors don’t seem to read). More LP units outstanding and higher distributions per unit always means more cash flow to the GP via IDRs, this is MLP Math and true for any MLP with IDRs. Just like it is good to be the King, it is good to be the General Partner. He also rightly points out that the oil production within KMP is a riskier asset and cash flow profile than a long haul pipeline and that it represents roughly 20% of EBITDA. If you own any Kinder Morgan related investments you should already know and understand that fact. I highly recommend that anyone who owns any Kinder Morgan investments read the Hedgeye report to learn about the risks, issues and concepts that Kevin spells out. The market will weigh in on whether or not it finds KMP’s sustaining capex acceptable but I can see both sides of the argument. The replaced pipe with higher capacity can be viewed as growth capex plus it has upside optionality from the increased capacity and if not fully utilized the new pipe will probably have less wear and tear on it if running substantially below capacity (i.e. 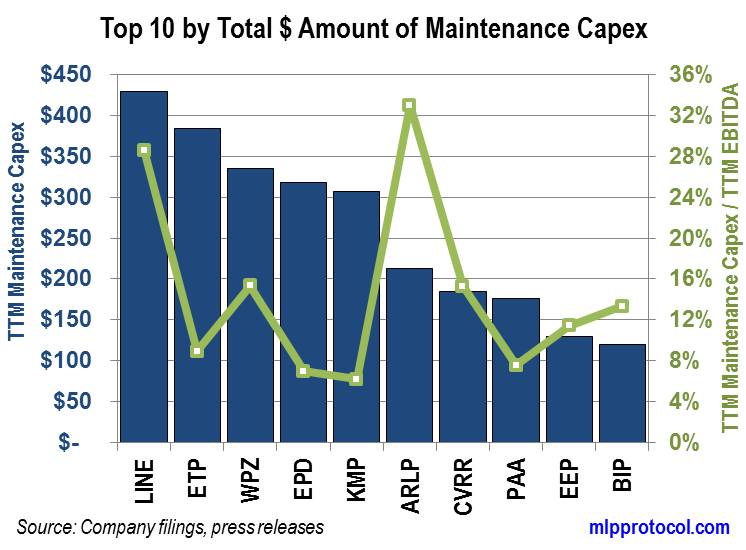 potentially lower relative maintenance capex going forwards). The growing total production of hydrocarbons going on in the North America will continue to provide ample volume growth opportunities for midstream assets for perhaps the next decade (or even more as they continue to find new ways to further enhance recovery rates from source rocks, the collective level of combined genius trying to figure that out is stunningly impressive). The ongoing growth may serve to continue to keep this maintenance / sustaining capex and cost concept on the back burner but you should read the report and learn as much as possible so you understand the market risks you are taking. This entry was posted in Chart of the Week and tagged distributions, dividends, investments, Kinder Morgan, Kinder Morgan Energy Partners, KMP, Master Limited Partnerships, MLP, MLP maintenance capex, MLPs, yield. Bookmark the permalink. 4. the annual maintenance capital theoretically is the replacement cost of the asset (not the fair value) divided by the economic life; if an asset with a 30-year economic life costs $60 million to replace, maintenance capital is $2 million/year so the asset would be entirely replaced in 30 years at that rate. 5. however, most assets are not replaced according to this theoretical schedule; some aren’t even replaced at all. Maintenance capital is a cash outflow that is “lumpy” over the years, as it is not necessary to replace something that does not need replacing. Remember that normal maintenance includes the testing and inspection of assets to assess their fitness for intended use, safety, etc. Based on such work, it is determined whether replacement is needed. It isn’t pre-determined by management. 6. thus it doesn’t surprise me that maintenance capital is only a fraction of the dd&a. In addition, because of the aforementioned variability in maintenance capital, I find it difficult to draw meaningful conclusions from the ttm maintenance capital/EBITDA calculations. 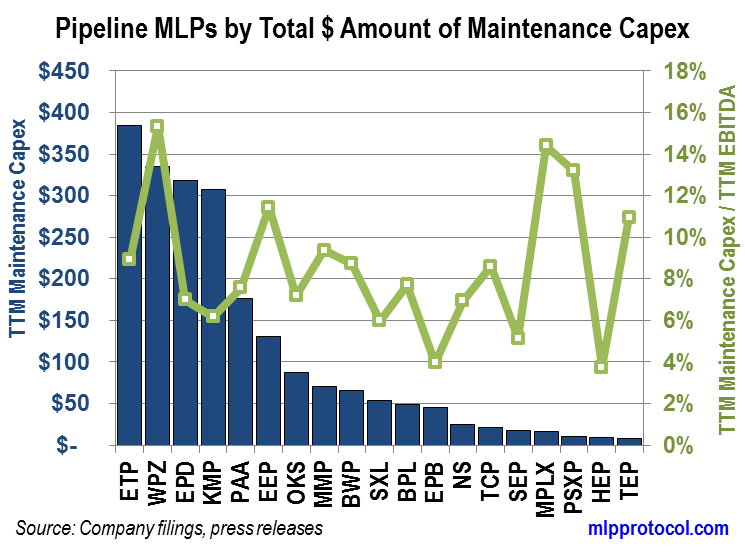 One last point is whether the Hedgeye report revealed any long-term statistical evidence that proves KMI/KMP had a worse safety record than other mlps and non-mlps in order to bolster the argument that maintenance capital was chronically underfunded and assets were being starved? None was mentioned so I assume not. If you go to the Investor Village website and the MLP board, check out message #32470. Thanks rlp2451, I didn’t know the full report was posted for free. I’ll go and see if I can find it. Philip – You probably ought to read the Hedgeye report. They post a 2013 KMP sustaining capex of $339M.